So, I’m about to leave Tajikistan. And I was thinking about all these lists about goods and bads and lessons learned that I’d share with this blog. But, at the end of the day, I think on both sides, it comes down to my life in Tajikistan being surprising, and sometimes pretty weird. In the span of the last three days I’ve given a research presentation to the Persian Department at the Tajik National University, gone on a final Osh picnic to Varzob, and caught the flu, necessitating a visit to the doctor for the first time since I’ve arrived here. Nearly made it! Final Group Osh. Looks pretty much the same as they all do. Nights spent shivering myself to sleep in the dead of winter. The sinking feeling of coming home and realizing there was still no electricity. The loneliness of realizing that the majority of my peer group here was married with a few kids. Car sickness. So much car sickness. Stop building tall flagpoles and pave some roads, Taj! Waking up every single day before 6am, because if I went running any later I’d be stared at, followed, shouted at, etc. Going to bed every night around 10pm, because there just wasn’t anything else to do. 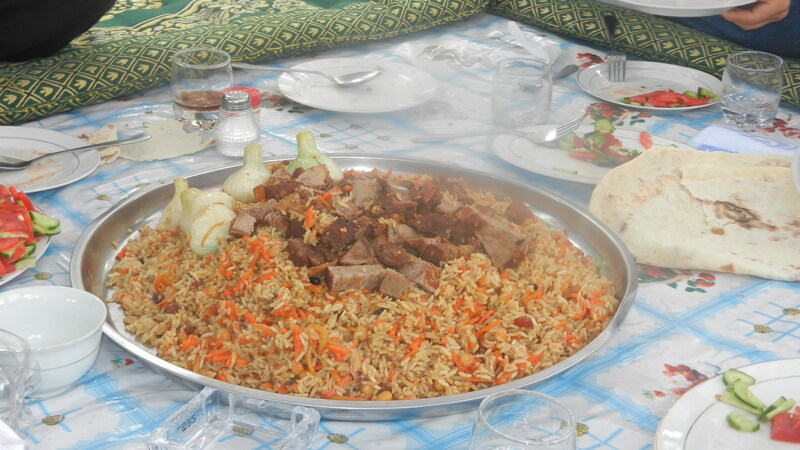 All the oil in Tajik food. Cotton oil, flaxseed oil, vegetable oil, just lots of oil. But there are also memories I’ll cherish, things I’ll genuinely miss and hope to see again someday. 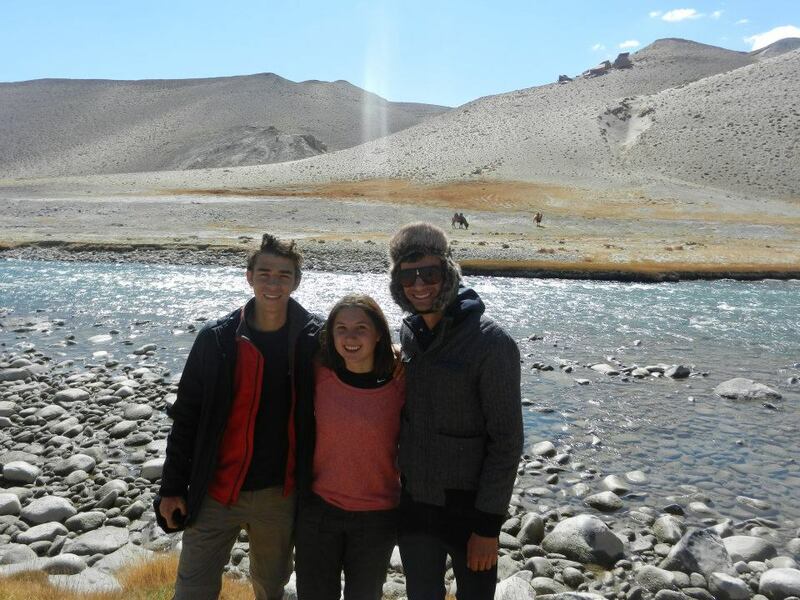 Chris, Joey and me, on the Panj River near the Wakhan corridor, in the Pamirs. Behind us are wild batrian camels. As a US American, I will never cease to be amazed by still-standing structures that are more than 500 years old. There is a part of me that is also extremely grateful towards Tajikistan. Most languages, you get a pick of your location, dialect, etc. when you decided to study abroad. As a US citizen studying Persian abroad long-term, that’s not really the case. For better or worse, we come to Tajikistan, and even though sometimes the Tajiki-Farsi dichotomy is frustrating, I dread the day when studying here isn’t an option. I came here a wide-eyed Perso-phile, and I’m leaving as someone who can communicate effectively in Persian (most of the time). So it was worth it. Honestly, I don’t pick up languages easily. And I think the one-on-one/two-on-one classes that I’ve had all year have probably been the reason I’ve come along as far as I have. I’ll deeply miss my professors and my classes. In case you thought THAT was sentimental, let me turn now to my host family. I’m pretty sure there have been times when my host family thought I was a complete nutter. And there have definitely been times when I thought they were totally bonkers. There have been more cross-cultural miscommunications than I can count. And yet, when I leave, I will miss my host family most. I decided early on that host family bonding was one of my priorities, and thanks to the fact that my host family was genuinely interested in spending time with me, it remained one. I love that when I come home a million people greet me (some of who I’m always supposedly related to but have never met before). I’ve even grown fond of my host brother bursting into my room and demanding that I go with him to buy a shepherd dog (this happens about twice a day). I’ll miss how, even though they think its nuts, they always make sure my Osh is meat-free. I’ll miss my host mom describing the millions of cakes she can make, and my host baby attempting to pray and falling over, and taking my little host cousins for walks around the block (one toddler on my shoulders, two toddlers holding my hands). So apparently its cold everywhere in Eurasia is right now. But Tajikistan wins because the cold is compounded by the frequent electrical outages, and the fact that the city planners of Dushanbe decided to pave entrences to many buildings with a marble-like material. Marble gets really slippery when it snows, guys! Generally, I see about 10 people fall down per day. Sometimes I fall down too. 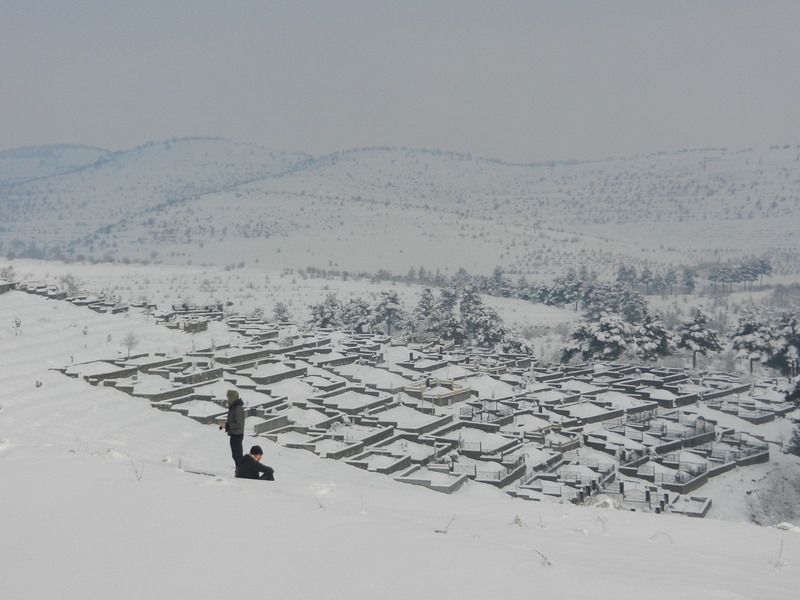 Clearly, if I stop shivering for a second and look around, Tajikistan is pretty gorgeous in the winter. 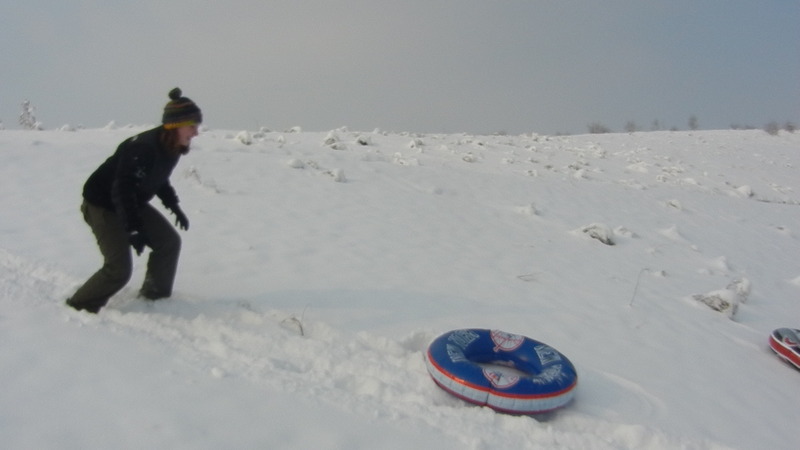 In some spots, the snow was up to my knees! And it felt like if you just kept walking, you just keep reaching more and more mountains, until you were in the Pamirs. Its pretty easy to stay inside and read or watch TV. But there are actually decent cultural entertainment opportunities around. Saturday night we went to see a documentary at a (very warm) hotel theatre. It was called “The Desert of Forbidden Art.” I high recommend it. It is voiced by Ben Kingsley, so it is not one of those obscure Central Asian things I occasionally recommend. Its about a museum in Karakalpakstan (in Uzbekistan) where anti-Soviet art was protected, especially during Stalin’s era. I realized I hadn’t been to see a film in a theatre since August. In general, we’ve been making much more of an effort to go to these sorts of things this semester. Last week we went to a Russian play, and we’re hoping to do something similar next week. Thank goodness classes have started. Classes here are pretty awesome. For my history class, we are reading a 9th/12th century of Bukhara (written in Arabic in the 10th century, updated and translated in the 12th). Its the same one we started reading in my English language history class last semester, except now I have to write compositions about it in Persian. It is very exciting. I told my Farsi professor that I wanted to focus on improving my reading and writing this semester, so I have already had many compositions assigned. I come home, plop down in my living room, and write as much as I can. My last writing assignment was to explain the U.S. electoral system in Persian. It was difficult, mostly because the U.S. electoral system is too complicated in any language. Dari classes are also pretty exciting. And confusing! Its not that different, but in many cases, I do understand, but it doesn’t sound like something I’ve heard before. Or it sounds like someone got confused and started mixing Farsi and Tajiki together in a blender. Its actually pretty useful for reading my historical text though… I’ve learned words in Dari class that my Farsi teacher has then pointed out as uncommonly used Farsi words in the History of Bukhara text. In general, I’ve found that this semester I have a lot of control over what I study (taking half of my classes alone will do that, I guess), which in turn makes me a lot more motivated to study. Pretty much what it sounds like. I’m staying as warm as I can, and hoping that spring comes soon. All in all, its not bad… the pipes in my house haven’t frozen, my space-heater works, I’ve got my ghichak to practice, and I’ve downloaded new books for my Nook. Hopefully, I’ll be creative enough to keep coming up with stories for this blog until spring finally makes an appearance! This, I’m wandering inside the red world.